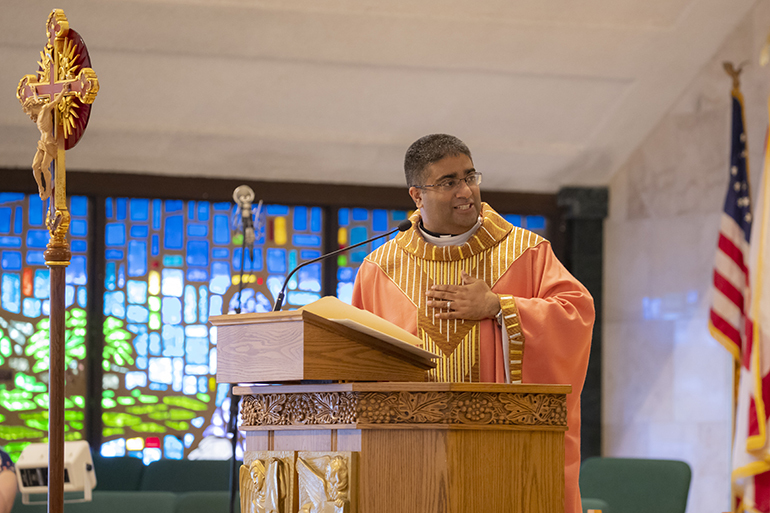 Father Biju Vells, pastor at St. Pius X Church in Fort Lauderdale, addresses his congregation during the Mass celebrating the parish's 60th anniversary. 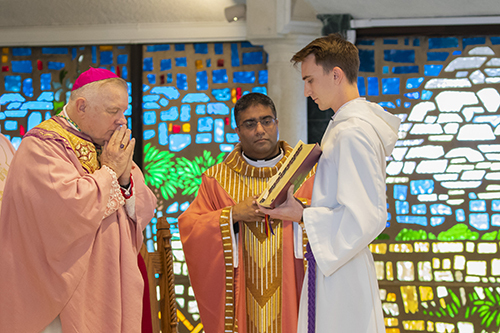 Altar server Hunter Taravella holds the Missal for Archbishop Thomas Wenki and Father Biju Vells at the beginning of the Mass celebrating the 60th anniversary of St. Pius X Church in Fort Lauderdale. Archbishop Thomas Wenski gives the homily during the Mass celebrating the 60th anniversary of St. Pius X Church in Fort Lauderdale. 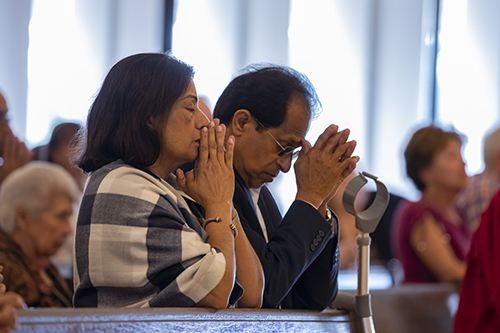 Mary and George Vells, parents of pastor Father Biju Vells, pray during the Mass celebrated by Archbishop Thomas Wenski in commemoration of the 60th anniversary of St. Pius X Church in Fort Lauderdale. FORT LAUDERDALE | Located near the beautiful Fort Lauderdale beaches, St. Pius X Church has been a tight knit community since it was established in 1959. 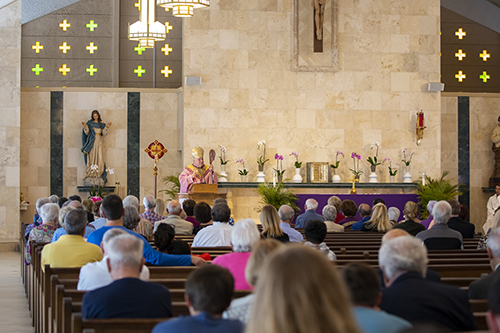 The church, the 11th parish formed in Broward County, marked its 60th anniversary March 30 with a Mass celebrated by Archbishop Thomas Wenski. Over 100 people attended the Mass, which was followed by dinner at the Coral Ridge Country Club. The church is named after Giuseppe Sarto, who served as Pope Pius X from 1903 until 1914 and was canonized in 1954. His papal motto, “Restoring all things to Christ,” is prominently displayed in the sanctuary. He is remembered for his resolute condemnation of the heresy of modernism but also for allowing children as young as seven to receive Communion. Inside the church is a shrine to St. Pius X which contains an Italian-carved statue of the saint, and a niche with the saint’s relic. Nine pastors have served the church over the years. Throughout that time the parish has undergone several renovations, the most recent in the fall of 2018. 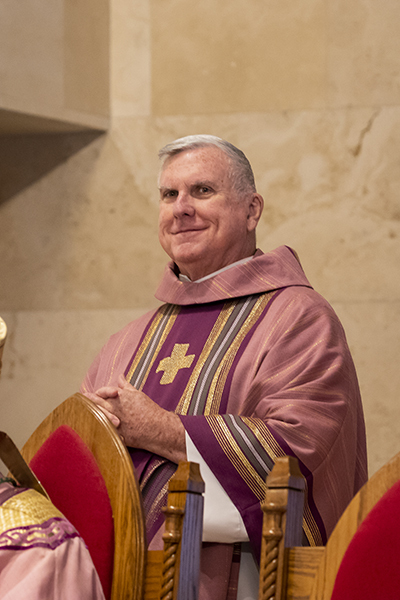 Father Gerald Morris, a retired archdiocesan priest and former pastor at St. Pius X, takes part in the Mass in commemoration of the 60th anniversary of the parish. Among the many things that make the parish community special are headsets that are made available to those with hearing impairments. The headsets help parishioners follow along with the Mass. Ten headsets are available for those who need them. Currently, the parish has 400 families when the season is at its peak and the “snowbirds” are in town. On a regular basis however, the parish has approximately 100 active families or about 100 people at each Sunday Mass. The plan for the parish is to continue to grow and minister to those who may either be visiting the area or attend seasonally. The future is in the young people and the parish celebrates each baptism with great enthusiasm. “We are a family here and we welcome you to come visit us,” said Father Vells. 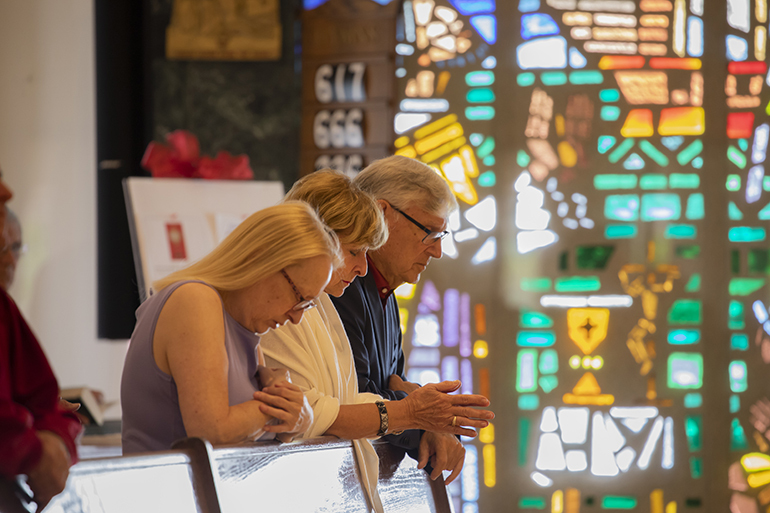 Parishioners pray at the Mass celebrating the 60th anniversary of St. Pius X Church in Fort Lauderdale. Click here to post your comments about this article. The Archdiocese of Miami welcomes input in response to the current news article posting. However, the Archdiocese reserves the right to deny posting any information or comment that does not adhere to the teachings of the Catholic Church. Comments will not be posted if they contain insults, ethnic slurs, personal attacks or obscenities, or if they are not in keeping with charity, civility and the standards and teachings of the Archdiocese of Miami and the Catholic Church. Anonymous comments will not be published. Minors should seek parental permission before submitting a post. All comments submitted will be reviewed and may be edited by the Communications department before going live on the website. You agree that you are responsible for any postings/ comments you make, and for any consequences thereof. You agree that all postings/ comments will be in compliance with all applicable local, state, national and international laws, rule and regulations. The Archdiocese takes no responsibility for third-party content nor does it have any obligation to monitor such third-party content. By submitting or posting content ("Content") you grant the Archdiocese a worldwide, non-exclusive, royalty-free license to reproduce, publish and distribute such Content. You represent and warrant that you have all the rights, power and authority necessary to grant the rights granted herein to any Content. Click here to accept the terms of this disclaimer. Your comment will be submitted to the Archdiocese of Miami for approval and then published on the web site. While your name will be published, telephone and email addresses are contact references that will only be used by the Archdiocese. They will not be shared with third parties.